This tangy-sweet chicken skillet is a cinch to make! Cook chicken in large skillet sprayed with cooking spray on medium-high heat 5 min., stirring occasionally. Add vegetables, dressing, honey, garlic and ginger. Cook and stir an additional 5 min. or until chicken is cooked through and vegetables are heated through. Serve with rice. Substitute 1 Tbsp. freshly grated gingerroot for the ground ginger. Keep a piece of gingerroot in the freezer to make it last longer and grate it frozen when needed. 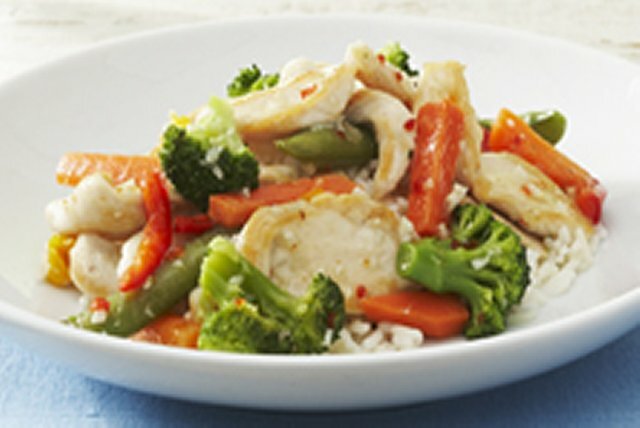 This flavourful tangy-sweet chicken it a great option for a healthful meal and as a bonus, the vegetables provide a good source of vitamin C.